Harmonious order. True talent. Dignified culture. Civilization. Highly formative for the human personality, it shows in its imponderables a profoundly Christian character. Las Meninas painted by Diego Velázquez in the year 1656. It is kept in the Museo del Prado in Madrid, Spain. The famous painting by Velázquez, Las Meninas [The Maids of Honor], is rightly considered one of the great works of pictorial art. The scene portrays the childish and candid grace of the Infanta, the most dignified and respectful tenderness of the young noble ladies who serve her, and on the left, the proud and noble bearing of a Knight of Santiago (who is actually the painter Velázquez himself). Taken as a whole, the scene is expressive of an ambience that is recollected, elevated, and profoundly civilized. An attentive and prolonged consideration of this masterpiece goes beyond pleasing one’s artistic sensibility; it is highly formative for the human personality. If a person looking at this were to suffer a sudden disturbance affecting his eyes, nerves, or mind, one would expect the harmonies of the painting by Velázquez to disintegrate before him. At the extreme point of this disturbance, it could possibly reach the horrifying state expressed in the other painting on this page. The contrary could never happen. 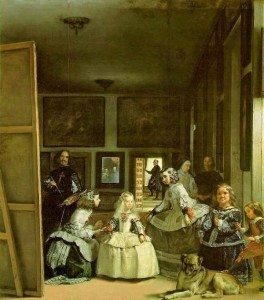 If someone were simply to study the second painting, and begin to suffer problems with his sight, nerves, or mind, he would never reach the point of seeing Las Meninas of Velázquez. Disorder. Extravagance, Imbalance. Intemperance. 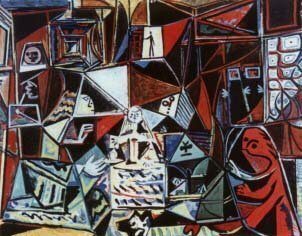 Between August and December 1957, Pablo Picasso painted 58 interpretations of Las Meninas. This is so evident, it does not require demonstration. This is because the first painting is not a product of disorder, but rather of order, talent, culture, and civilization. It shows in its imponderables a profoundly Christian character. The second is the fruit of disorder, extravagance, imbalance, and intemperance. It can only proceed from a soul full of disorderly passions or from an illness. The second painting shows Picasso’s copy of the immortal work of Velázquez. Originally published in Catolicismo, No.131, November, 1961. This entry was posted in Plinio Corrêa de Oliveira and tagged Ambiences, America, Catholic, Catolicismo, chaos, character, Christian, civilization, Civilizations, Correa de Oliveira, Costumes, culture, Diego Velasquez, disorder, extravagance, Family, imbalance, Infanta, intemperance, Lady, Las Meninas, Maids of Honor, noble, Order, Pablo Picasso, Plinio, Property, society, talent, TFP, Tradition by Plinio Corrêa de Oliveira. Bookmark the permalink.